Janadriyah 2013 is just around the corner so I thought of sharing with Blue Abaya readers the guide I wrote for the Women's Skills Bureau March Newsletter. The festival will begin on the 3rd of April continuing until the 19th April 2013. The first few days are men only and the King will inaugurate the festival with a spectacular opening ceremony Operetta on the 3rd April. The opening festivities will be televised live. Family days are beginning from Monday 8th April. The festival area is open all day but schools visit during the mornings and to public they officially open the gates at 4pm (or after Asr prayer) and it's open everyday until midnight. The gates sometimes open early so it's worth going well ahead of time because of the bad traffic and parking. The entrance is free for all. The annually held Cultural Heritage festival Janadriyah is definitely one of the most important cultural events of the year and a must visit for all expats in the Kingdom of Saudi-Arabia. This is when you can immerse yourself in the Saudi culture, enjoying what the real Saudi-Arabia and the friendly hospitable Saudi people have to offer. This year festival starts on the 3rd of April and continues for two weeks full of Saudi traditions and unforgettable experiences for the expats and locals alike. There is something for everyone at Janadriyah! Here are some tips on fun activities with kids and where to find the best places at the Janadriyah village for families. The vast festival area may seem daunting for first time visitors, there seems to be endless places to see and it might be hard to choose which areas to go to. The best time to visit for families with children would be on the weekdays and it’s best to arrive as early as possible. Officially the festival starts at 4 pm, but on many occasions they will open the gates much earlier. There are plenty of vendors outside the gates selling everything from toys, silly hats and wigs, sunglasses, veil decorations, Saudi foods, flags and more. With luck it’s possible to find Saudi ladies who will make quick beautiful henna tattoos for 15 sr on visitor’s hands. On weekends the festival area will get very crowded and the parking lot is disorganized and can get chaotic. Enter from the front gate, which is directly opposite the highway. Upon entering the area (admission is free for everyone) take a map from the info stands; they will have English language maps too. Staff will provide small children with wrist bands that have the parent’s mobile number on them in case they were to get lost in the area. It’s recommended to bring a stroller because the area very large and takes many hours to walk through. It’s best to start out by exploring the Jizan and Farasan area directly to the left from the gates. A large white wall marks the entrance. The Jizan dancers are fun to watch, their dance is very lively and the beat is fast and gripping. Children will love the show, the traditional fishing boats and there’s a camel running a sesame seed mill. From this area you can buy beautifully scented jasmine flower necklaces and flower hair bands for the kids (and why not adults too). Continuing on, the next recommended areas are the Qassim with the high tower and the surrounding marketplace. For kids there’s camel riding and from here it’s recommended to try out the Saudi foods. A must try are the Kleja breads made by the Bedouin women in an oven on site. Various kinds of delicious mammoul (date filled biscuits) can also be bought here. To the left from behind the Qassim tower the road leads to the farm area where kids can see all the typical farm animals in Saudi Arabia. Continuing on forward from the farm area visitors will reach the other main road. At the end of this road are the Equestrian club areas where the statuesque Arabian horses can be seen. The main road leads to the Medina region on the right hand side which can be recognized by the golden dome. It’s recommended to try out the foods here and see the men dancing the famous “spinning” dances. This area also has a nice bazaar for buying souvenirs. Another area children will enjoy is the marketplace opposite Medina, here you can go on donkey carriage rides, climb on a huge fishing boat, see boa snakes and join in on the Saudi traditional children’s games. If you’re interested in seeing the hunting falcons and for a chance to hold one, visit the Eastern Province section where you’ll also find a replica of the Qara caves and lots of Saudi craftsmen. The architecture is beautiful inside and outside of the houses. For the girls and moms it’s worth visiting the women’s only hall where you can experience traditional Saudi women’s attire, music and dances. For the boys and dads there’s the Saudi National Guard exhibit next to the Makkah area where you can see tankers, helicopters other military equipment. 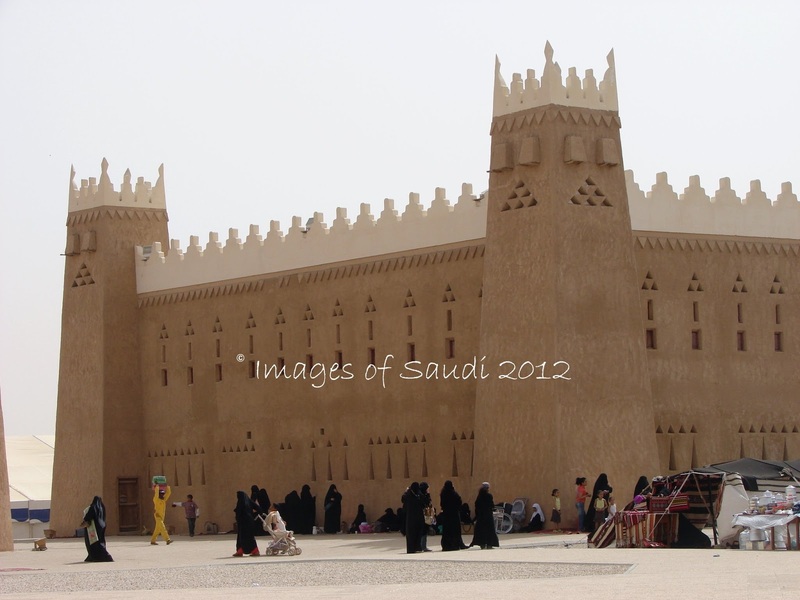 Janadriyah is the best way to take a quick course on the Saudi culture and customs and makes for a nice family outing. Click here to download the WSB March newsletter full of useful info! I sure hope I can attend one of these years... It looks like one of the best events in KSA - great pics!!! Thanks for the expanded description. Going there without any knowledge means we'll miss a lot. er, any news on Jackie Chan turning up? Thanks for the great description. I'm excited to go. Is it possible to get wheelchairs at the festival? My aunt is elderly and really wants to go. Hope you can let me know. Susie I would be more than glad to show you around!! Just found your excellent blog this morning Laya and love your wonderful photographs of events, people and atmosphere at Janadriyah...I have always missed the event but am going this year and really excited about it. Is their a camera rule or protocol at the festival...should I ask before taking a shot? Choni-thank you for the kind words and hope you enjoy the festival! No policy for that, and you will notice people are quite relaxed about it! to the anonymous above, first to answer your Q as far as I understand only the operetta was changed and it will continue normally and yes it's mens days until sunday. As for your other cmment, can you please clarify what you mean here because I am confused, went to this site and first of all I have not read any articles on there before and want to understand what is being implied here? Also, is there an article on there that has plagiarized from Blue Abaya or what is meant by fabrication?? Please let me know!! !